This week I jetted off to Torrevieja in Spain for a must needed rest. I joined my parents out in a two bed apartment with my sister for the week. Apart from having to get up at 3am to go to the airport, I had such a relaxing week and feel much more human again. I've found it quite hard to blog recently, especially when it is so grey and miserable outside. Not only does it effect your mood but it really narrows the window in which you can take good photos for your blog. I've decided to do 3 posts a week for the moment instead of 4 as I really want to put up content that I feel proud of and not just churn out rubbish for the sake of it. My holiday has refreshed my brain and mood and I feel more excited to blog again. During the week we did a bit of sunbathing, walked along the beach and ate lots of lovely food including tapas and paella. The weather was very good for February, we had 3 sunny days which were around 16 degrees and hot enough to lay in the sun, much better than I was expecting. Obviously all the lovely food we ate had to be washed down with some lovely cocktails too, this photo was taken at a little cocktail hut along the sea front near where we stayed. 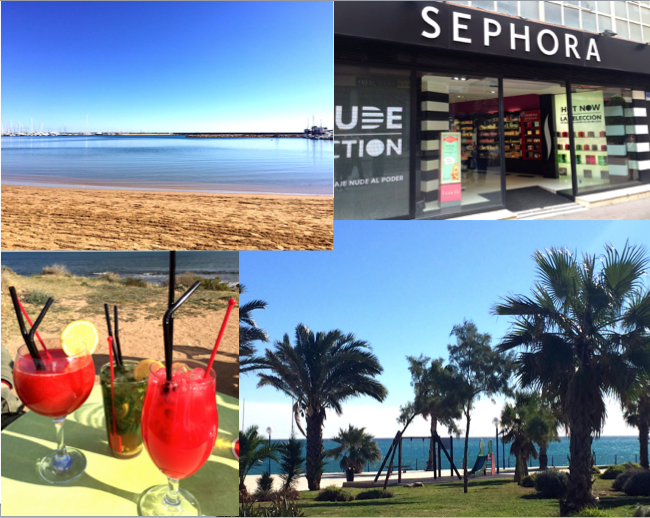 We also visited Alicante for the day where I had to make a trip to Sephora. There will be a haul coming your way very shortly. I also got some new clothing items which I will show you too. If you missed it, I did a Space NK haul and also a DIY for home decor photo frames too. DIY photo frames PLUS discount code!